Japanese whiting or kisu in Japanese is a species of fish that inhabits the water from Hokkaido to Kyushu, Japan that is generally caught between the summer and fall months. It is not fatty but said to be tender. It can be eaten as sashimi and in tempura dishes as well as fried up in a batter like smelts. 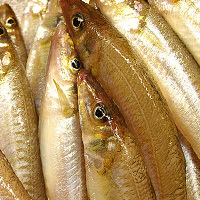 The calories in Japanese Whiting per 50g(1fish small edible part) is 43 calories. Japanese Whiting is calculated to be 85Cal per 100 grams making 80Cal equivalent to 94.12g with 9.6g of mostly protein、0.2g of fat、0.05g of carbohydrates in 50g while being rich in vitamins and minerals such as Vitamin D and Vitamin B12.